GUTHRIE, Okla. – The Timed Event Championship is a rugged endurance test for even the most experienced cowboys in the unique competition. Typically it’s a great measuring stick for the newcomers. But 2013 might just be a changing of the tide, so to speak. Of the top eight cowboys in the 15-run aggregate, three are first-timers, including the top two: leader Trell Etbauer of Goodwell, Okla., and Dustin Bird of Cut Bank, Mont. “I’m just taking a good throw and making sure everything’s set up well and trying not to be fast,” Etbauer said after the third round Saturday afternoon, in which he has a cumulative total of 175.7 seconds, just 2.4 seconds ahead of Bird – the other first-timer near the top of the leaderboard is Erich Rogers of Round Rock, Ariz., whose 189.5 sits sixth. The key is to take a different approach to the Timed Event than cowboys typically use while competing on the rodeo trail. Consistency is the key through the five-round contest, in which cowboys must rope or wrestle 25 animals over three days. Each round is made up of single runs in all five timed-event disciplines: team roping-heading, tie-down roping, team roping-heeling, steer wrestling and steer roping. “When you back in the box and nod your head at a normal rodeo, you want to go out there and be as fast as you can and win every time,” said Etbauer, the son of two-time world champion saddle bronc rider Robert Etbauer and the nephew of five-time titlist Billy Etbauer. “Coming here, I think it’s best to back in there and make sure you have everything set up and go through the steps and just take your time. 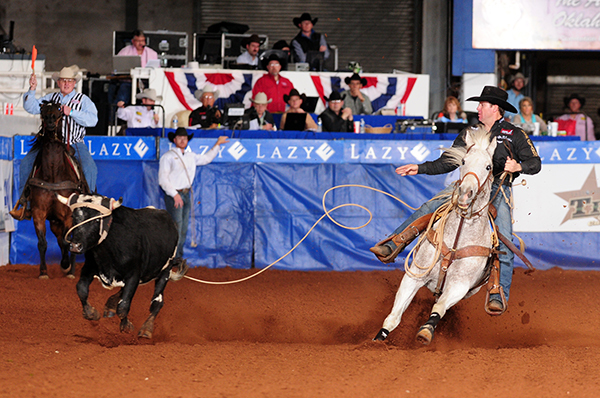 Trevor Brazile of Decatur, Texas, knows that’s the method to the Timed Event madness. In his career, Brazile has won this championship six times and holds this prestige up there with his 10 all-around gold buckles in the Professional Rodeo Cowboys Association. The 17-time PRCA World Champion posted the fastest run of this year’s event with a 44.3-second round; it was the second fastest go-round in the 29-year history of the Timed Event Championship, second only to Brazile’s record run of 43.5 seconds in 2006. “Just knowing you have to be 13.0 … as a steer roper, I feel like I should’ve gotten that record,” said Brazile, who owns three steer roping world championships, three tie-down roping titles and a heading gold buckle. He’s just one of two men to have qualified for the National Finals in all four roping disciplines. Though he doesn’t wrestle steers very often, his fast round included a 4.0-second steer wrestling run, tying Clayton Hass for the fastest of this year’s event so far – both occurred Saturday afternoon. Two-time Timed Event champion Kyle Lockett posted the second-fastest round so far with a 46.5. The 2013 Timed Event Championship is a Lazy E Production. For more information on the Timed Event Championship or other Lazy E events, contact the Lazy E Arena, 9600 Lazy E Drive, Guthrie, OK 73044, (405) 282-RIDE, (800) 595-RIDE . AVERAGE LEADERS: 1. Trell Etbauer, 175.7; 2. Dustin Bird, 178.1; 3. Jess Tierney, 182.5; 4. Daniel Green, 184.0; 5. Paul David Tierney, 193.7; 6. Erich Rogers, 189.5; 7. Russell Cardoza, 200.6; 8. Trevor Brazile, 201.4. FASTEST ROUND LEADERS: 1. Trevor Brazile, 44.3 seconds; 2. Kyle Lockett, 46.5; 3. Jess Tierney, 50.5; 4. Daniel Green 51.0; 5. Dustin Bird, 52.2; 6. JoJo LeMond, 52.9. ROUND 3: 1. Trevor Brazile, 44.3 seconds; 2. Kyle Lockett, 46.5; 3. Dustin Bird, 52.2; 4. Paul David Tierney, 53.6; 5. Russell Cardoza, 57.3; 6. K.C. Jones, 57.5.